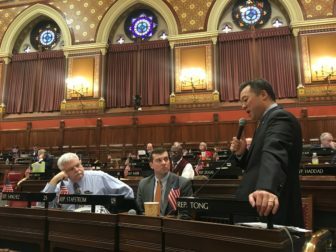 Rep. William Tong, D-Stamford, sponsor of the bump stock the bill, answers questions about it on the House floor. The state House of Representatives approved a bill Tuesday that would ban bump stocks, moving Connecticut one step closer to a number of other states that have prohibited the devices used in the deadly Las Vegas shooting last October. The bipartisan 114-35 vote — which came at the end of an exhaustive five-and-a-half hour debate — moved the measure to the Senate floor. Two Democrats voted against the ban and 38 Republicans voted for it. Bump stocks allow semiautomatic rifles to fire at a rate similar to that of machine guns. The bill also would ban trigger cranks and other so-called rate-of-fire enhancements. States including Massachusetts, California, Vermont, New Jersey, Washington and Florida already have enacted their own bans. The U.S. Justice Department also proposed a federal regulation in March banning the devices. Opponents of the measure repeatedly criticized the bill for criminalizing an object citizens already had bought legally and for not adequately ensuring citizens would know about the ban. “It is not our role as legislators to be the overlords of our constituents and tell them what they can and cannot do … and I don’t think it’s our job to start banning things because people in this room think that other people can’t be trusted with them,” Rep. Rob Sampson, R-Wolcott said. Should the bill become law, those who possess the devices after Oct. 1 will be guilty of a Class D felony. Those who have a gun permit and possess a rate-of-fire enhancement device will only be guilty of a Class D misdemeanor on a first offense until July 1, 2019, and a Class D felony on a subsequent offense. Republicans raised two failed amendments attempting to change the bill, including one that would allow residents who already own bump stocks to keep and register them with the state. Members of Moms Demand Action and Connecticut Against Gun Violence, clad in bright red and orange shirts respectively, filed into the Capitol to show support for the legislation. The advocates stressed the measure would further ensure public safety. “This essentially turns any weapon into a machine gun and that’s highly dangerous; it’s a public safety issue,” Action Together Connecticut President Terra Volpe said. Volpe said she is comfortable with hunters keeping their weapons but said they do not need bump stocks. Scott Wilson, president of Connecticut Citizens Defense League, the state’s largest gun group, said lawmakers are looking for more ways to limit the rights of law-abiding gun owners. The rapid rate of fire can be achieved by using belt loops and shoe strings, and banning the devices wouldn’t stop anyone, he said. “The fact that someone that’s so intent on killing a mass number of people — they won’t be swayed by banning a piece of plastic,” Wilson said. Rep. Holly Cheeseman, R-East-Lyme, said the best thing to do is pay attention to the warnings and signs. An adopted amendment to the bill would exempt licensed firearms manufacturers who make the devices to fulfill military contracts. It also would require people who move to the state already owning the devices, or service members returning from deployment to remove or surrender them within 90 days. Under the bill, the commissioner of Emergency Services and Public Protection would need to provide written notification of the law on its website and to federally licensed firearm dealers. Jeremy Stein, the executive director of Connecticut Against Gun Violence, said he was excited about the House’s overwhelming passage of the bill, but was not surprised at the length of the debate given the similar length of the measure’s public hearing. “But I am dismayed that it took this long to pass something which seems to be something that most of the assembly was in support of and due to a few people that wanted to drag this thing out and prevent the vote,” Stein said. 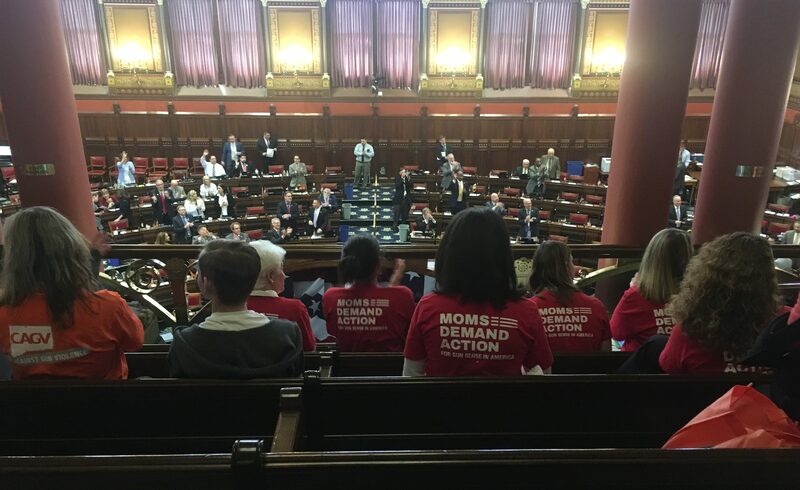 Members of Moms Demand Action and Connecticut Against Gun Violence await the House floor debate on bump stocks early Tuesday but finally left before it began.